Hey y’all, why don’t you go check out Part II of the ModFan Season Preview? Git! 2. Bucky Gleason wrote a column (which I refuse to link to because TBN doesn’t keep their archives up and I hate having dead links in my posts) under the headline, “Difficult to be inspired by lackluster performance”. Really, Bucky? I think it’s easy. The column is vintage Bucky. First he begrudgingly praises the team for the win, then he sagely and condescendingly dispenses advice to the fans to avoid enjoying the win too much, and then he grumps (with juuuust enough validity) about the the mistakes from first the three quarters, and then he completely ignores the rather remarkable manner in which Trent Edwards comported himself in the final ten minutes. You know, I’m not sure Bucky “gets” sports. If I can’t enjoy a fun come-from-behind win in which our rookie quarterback looks like a grizzled vet, why on earth would I even be watching football? I know it’s not Bucky’s job to be a fan, but is it really his job to be a total pill? I’m concerned that it is. As far as the headline goes, I happen to have an email from Bucky in my inbox archives in which he personally explains to me that the columnists don’t write their own headlines. I’ve always been confused about this little bit of publishing protocol. It seems to me that the headline is rather important and that journalists would feel strongly about how their articles are perceived “at a glance,” but I’m sure there is a good reason that a third party writes the newspaper headlines. I can only assume that if Bucky could have written his own headline it would have read, “Please Send Help. The Buffalo News has Kidnapped Me and Locked Me in a Dark, Dank Basement. I Have No Contact With the Outside World. I’m Totally Out of Touch. Please Call the Authorities.” No wonder TBN insists on writing his headlines! Poor Bucky! Listen up, yo! I know we’ve been lazy, but ModFan is still alive. 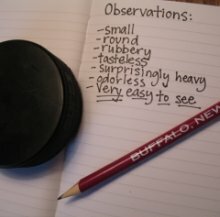 We’ve all written posts about the 5 Things We Loved/5 Things We Hated about this past hockey season. You can read Pookie’s post here, and Schnookie’s post here. Patty, Heather, and I will all post later in the week. 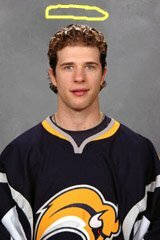 I just had the weirdest deja-vu. Have I written this exact post before? I would like to direct your attention here, where we tackle the Buzz Bissinger meltdown, ModFan-style. 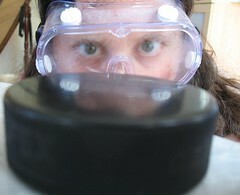 In our quest to fill the internet to the brim with hockey chatter, Heather, Patty, Pookie, Schnookie, and I have joined forces on a group blog. 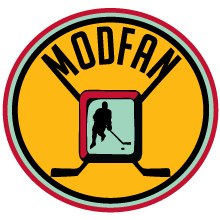 I am pleased to announce the arrival of ModFan! Yes, I know! It’s really, really exciting! You SHOULD be jumping up and down and squealing! Katebits: So, what’s the deal with Cujo? Can I love him without reservation? Schnookie: No. Never. DO NOT LOVE CUJO.